The first option is not really an “outcome,” but a discrete stage in the conflict which is practically over: Sunni jihadists have already defeated the Free Syrian Army (FSA), the dwindling fighting force of the U.S.-backed Supreme Military Council (SMC). Two weeks ago General Salim Idris, the FSA commander, even suggested that he might join forces with the government army in fighting Al Qaeda. On December 6 fighters belonging to the Islamic Front—a recently founded, Saudi-backed alliance of seven jihadist groups—captured the SMC bases and warehouses near the Turkish border, where vehicles and other U.S.-supplied “nonlethal” equipment were kept. They also forced Gen. Idris too flee Syria for Turkey. He later tried to put a brave face on the debacle, but the FSA is finished as a viable player. The Administration initially reacted by suspending the $260 million rebel aid program, but there have been signs in recent days that the White House may give up on the “moderates” altogether and divert future supplies to hard-core Islamist groups, provided they are not affiliated to al-Qaeda. "It's a pivotal point," a senior U.S. official told the CNN. "We need to figure out, what extremists do we deal with?" Dealing with Islamic extremists is never a good idea, but the White House will likely resolve it by calling the Islamic Front “moderate.” As it happens, the Islamic Front's charter, released on November 26, calls for the establishment of an Islamic state and the imposition of Sharia. It also endorses jihad and welcomes the Muhajireen (foreign fighters) as “brothers.” One of the seven groups within the Islamic Front, the Ahrar al Sham, routinely conducts joint raids with al-Qaeda’s two Syrian branches, the Al Nusrah Front and the Islamic State of Iraq and the Levant (ISIS). The assault on the Christian town of Malula last September was one such joint operation. Michael Hayden should be commended for stating so bluntly what we have repeatedly argued since the beginning of the Syrian conflict, that Bashar al-Assad’s victory would be the least bad outcome for Western interests in the region. This view is gaining credence. “We need to start talking to the Assad regime again” about counterterrorism and other issues of shared concern, Ryan Crocker, a respected veteran diplomat, told the New York Times on December 3. “It will have to be done very, very quietly. But bad as Assad is, he is not as bad as the jihadis who would take over in his absence.” As The Independent reported on the same day, Western security agencies now believe that returning jihad-veterans pose the most serious threat of terrorism in Europe and the United States. Bashar’s army and police have performed surprisingly well for almost three years now. Over the past year they have been able to consolidate their positions in about one-half of the country they still control, but eradicating the rebellion altogether will prove impossible for as long as weapons and money are provided by Saudi Arabia and the Gulf states, and jihadist volunteers keep arriving from all over the Sunni Muslim world. The current stalemate may create conditions for Syria’s eventual disintegration along both religious and ethnic lines. The fragmentation of Syria and its end as a single state within the borders defined by the 1916 Sykes-Picot Agreement may not be as destabilizing as General Hayden suggests. There is nothing sacrosanct about the lines of partition of the Ottoman Empire into Anglo-French spheres of influence, drawn rather arbitrarily by a British civil servant and a French diplomat almost a century ago. Syria’s effective partition along ethno-religious lines was introduced in 1922, during the French Mandate. It is arguable that the breakup has already happened, and that Syria no longer exists as a single political entity. The government enjoys majority support along a wide belt extending from the heavily Druze southern border with Jordan and the Israeli-held Golan Heights, through Damascus and Homs, and up to the disputed city of Aleppo in the northwest. This belt—about 40 percent of Syria’s territory, with one-half of its people—also includes Syria’s strategically important Mediterranean coastline, which is inhabited mainly by Bashar’s fellow Alawites and Christians. The rebels are overwhelmingly Sunni Muslims—which is not to say that all Syrian Sunnis support the rebels—and they control extensive tracts in the north and center of the country, and along the valley of the Euphrates to the sparsely populated Iraqi border in the east. The front lines are fluid, but it is a safe guess that the rebels dominate in one-half of Syria, with perhaps 40 percent of the population. Finally, Syria’s two million Kurds, ten percent of its people, have set up a de facto state in the northeast of the country (ca. 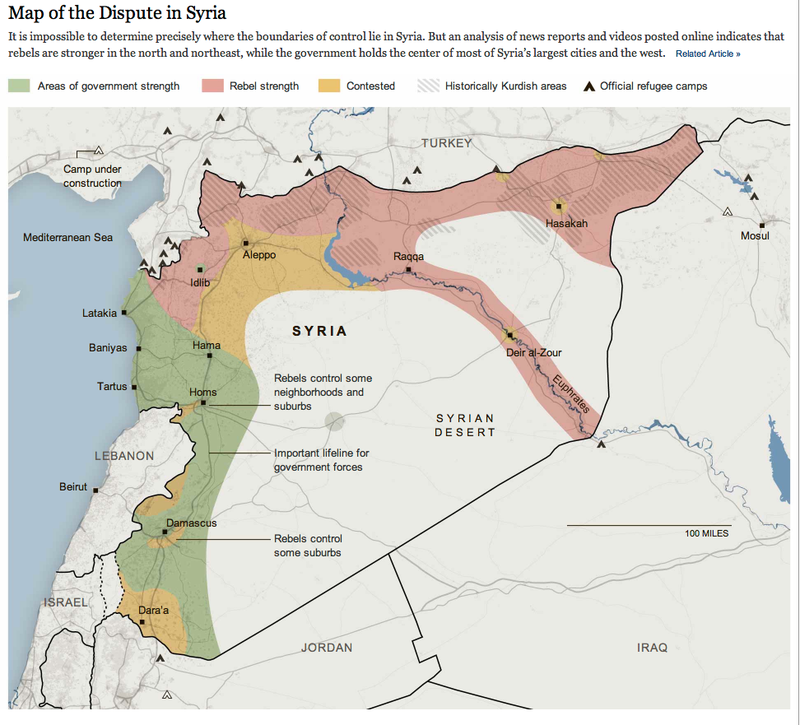 10% of Syria’s territory), with its own armed forces, police, courts, license plates, and Kurdish-language schools. They say that they would only seek autonomy within a future federalized Syria, but at the same time they reject any solution that would fall short of that goal. Syria’s effective breakup would be followed by population exchanges, which is preferable to the chaotic ethno-religious cleansing of which Syria’s Christians have been the main victims. 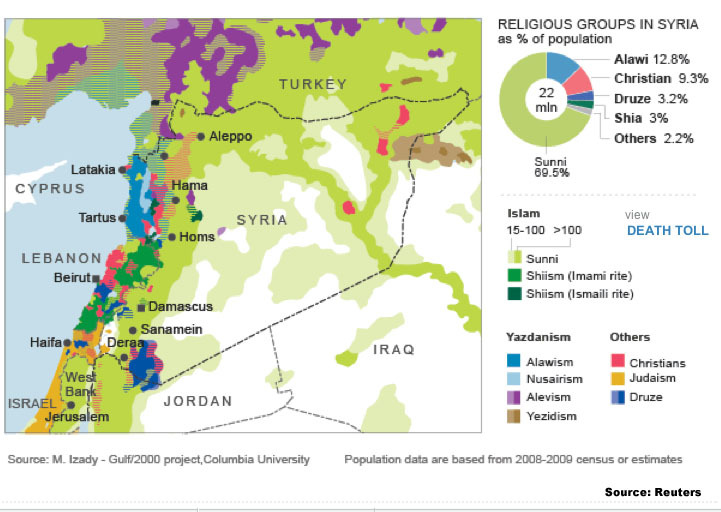 It is likely that, in addition to Alawites, Christians, Shia and Druze, many educated, urban Sunnis would also opt for the multi-ethnic and multi-confessional state of southern and coastal Syria, governed by secularists, in preference to the putative Islamic Caliphate in the north and along east, with rival factions vying for power. It is also possible that outside forces—Turkey in particular—will insist on the maintenance of a single-state façade. It is not possible for Syria to be recreated as a centralized, secularist-governed state, however, and it is equally impossible for the jihadists to terrorize two-thirds of Syria’s 23 million people into submission.